Alice is beautiful enough to be a model, she can sing and is an amazing song writer. She also has cystic fibrosis and this makes it difficult for her to predict what her days will look like. She will have good and bad moments, but that doesn't mean she lets her illness stand in her way. Alice is chasing her dreams and she will do anything to reach her goals. She's determined to be noticed by a record company and wants the world to hear her songs. When Alice meets Tom she knows he is the one. He feels the same about her, but being with someone who doesn't have a long life expectancy proves to be difficult for him. Alice is a ray of sunshine and she brightens up his life, but that means losing her will shatter his heart. Will he be able to handle this? Alice is a strong woman with plenty of talent and Tom can't stay away from her, but they do have their problems. 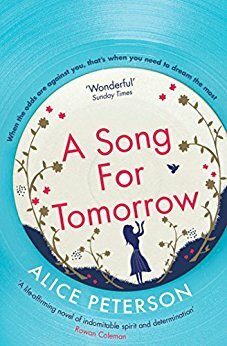 Alice wants to find true love, sing and live her life to the fullest, even if that means she's taking risks and might get hurt. A Song for Tomorrow is a beautiful poignant story about an incredible woman. Alice is fierce, beautiful inside and out and kindhearted. She loves with all her heart and I loved her passion for life, singing and writing songs. She has to accept that her illness brings a lot of uncertainties and she and the people around her are dealing with it the best way they can. I admired the honest way Alice Peterson writes about the insecurities that are coming with being this ill. She openly talks about mortality, relationship problems, frustrations because of being too ill to do anything and the heartbreak it causes. She combines this with a stunning story about an admirable woman, filled with positivity and hope and she does that in a terrific way. A Song for Tomorrow is an impressive story. The inspiration for the story was singer Alice Martineau and I loved how Alice Peterson combines fiction and reality. I admire the way she writes about living with a chronic illness, she describes the suffering and hardship as well as the wonderful moments, the extra enjoyment of things other people would take for granted. A Song for Tomorrow is a gorgeous combination of happiness and sadness. The ending moved me to tears and will stay with me for a long time. Alice Peterson has written another fantastic book that I highly recommend. If you love moving stories about inspiring main characters, living with a chronic illness while following their dreams, you don't want to miss A Song for Tomorrow. It sounds like a lovely moving book. Thanks for sharing it. Sounds like a great read. I like how it touches on a few different things. This story sounds wonderful and emotional, my fave recently. Thank you so much for this wonderful review of my book, I'm so glad you enjoyed it. This sounds like a genuinely touching read. I appreciate that it weaves together a number of angles that don't commonly appear these days, e.g. chronic illness. Oh boy, I'm of a generation (old!) that read the book 'Love Story'. The heart break of losing someone never gets old as a theme. Alice sounds like a strong woman & I'd like to read her story. Like AnnaZed, the description of this book reminded me of the books I read when I was younger that always moved me and reduced me to tears. I was thinking more of "Sunshine". I'm very thankful that patients with Cystic Fibrosis are living longer lives now than when Alice was born, when I'm sure her parents were told she wouldn't make it through childhood. Along with all the other lessons of this moving story, let's consider the need for further research (and the necessary funding) to find treatments and cures for debilitating and terminal diseases such as cf. This sounds inspiring and difficult at the same time. Especially as I live with several very limiting conditions (that thankfully aren't terminal though!) this presses some buttons. Hope and joy are so needed! Sounds very lovely, I'd love to read it. Sounds intense, but well done! It's nice to see a book with a disabled but positive role model. Looks like a book with a positive message. I love books about music and chronic illness because I know how they feel. It helps to remind me that I am not the only one struggling! This sounds like a very emotional read, added it to my TBR! Only this morning I was playing some of Eva Cassidy's beautiful songs. She really only made it big posthumously (she was only 33 when she died) but what a wonderful legacy to leave to the world. Positively haunting.